The icecream screen recorder is a reliable tool that lets you to capture any area of your screen that can be as a screenshot or video file. It is a easy to use software that comes with complete set of tools best screen capture along with audio recording. You can also record webinar, games, skype videos in HD and much more in a easy manner. You can also add annotation like circle, line boxes and arrows. 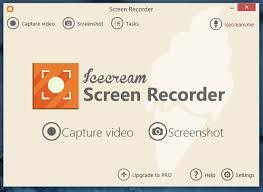 In icecream screen recorder pro it does not come with record time limit whereas the free version has recording time of 5 minute. You can also hide cursor or desktop icon as well as disable screen saver when it is necessary. This software is compatible with Windows 7,8, 8.10 and more. You can get it for Mac OS X Yosemite and OS X 10.9 Mavericks. This tool lets you to cut unnecessary section from the video whether it may from the beginning, middle or end of the video. It makes you to get the exact requirement for the video. The area selection lets you to select the area of the screen for screen capture or make video of single single. You can draw, outline and add arrows or text to your screenshot or video while doing screen capture. You can remove the default watermark and add your own watermark to the screen capture. There is also a way to record webcam video along with screen recording. It is helpful to explain a series of process through step by step method. This method does screen recording automatically by setting start and stop time for the capture. You can capture important online video or any other without requiring your presence. It also helps you to other work when the screen recording takes place. You can also select the screen recorder output video quality. Record any kind of game in a high quality manner and share it with others to show your amazing skill. This also helps you to enhance your gaming performance. You can display hot keys in the video during recording and it can be for start, pause and stop. The screenshot can be saved clipboard and you can easily share it through skype or email. This process lets you to select the size of a region around the mouse and it is helpful for the viewer’s to bring attention. This gives a fast access to all captured videos and screenshots which is useful for sharing to other sites. This tool graphically enumerates the steps of your tutorial which gives you better understanding of the process. The screen recorder is widely used app developer, marketing professional, businessmen, and by teachers and student.